FoodSaver freezer bags dominate the freezer bag market. There are many reasons for this. Here are a few. All FoodSaver bags are BPA free. So choosing them prevents this harmful chemical from seeping into your food, with potentially disastrous health consequences. They offer the option of zipper or heat sealed bags. With heat sealed FoodSaver freezer bags, the 2 sides of the bag merge into one, creating an airtight seal that dramatically increases the lifespan of your food, as we'll see in a moment. They come in bag or roll type so you get to choose the one that will sit better in your kitchen cabinet while waiting to be used. 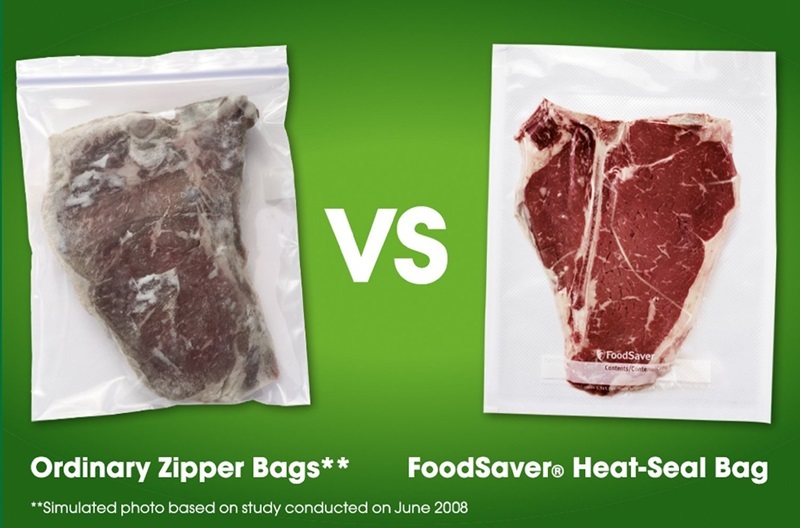 FoodSaver makes bags for a variety of freezing needs—from portion pouches that are great for freezing meals for one person to expandable bags that are designed to accommodate extra large items. The bags and rolls come in a range of capacities with everything from pint, quart and gallon. Or widths of 8, 11 or 15 inches. These capacity and width ranges give you the option to choose the right bag each time you need to freeze an entire rib cage or a handful of summer berries. Now, let’s delve into the last 3 of these benefits a little more. The FoodSaver bags and rolls are designed with channels that work with any of the FoodSaver vacuum sealing systems to ensure complete air removal. The picture below makes this difference abundantly clear. While it's recommended that you freeze pork chops for 9 months, you can get away with freezing them for 3 years if you use a FoodSaver freezer bag. That's just as good as freezing 2015 prices until 2018! Each freezer bag has several layers. This has 2 main advantages. First, it locks out moisture and oxygen—that are responsible for making food go bad. So the FoodSaver freezer bags don't fall in that category of bags that melt or shrink at the slightest contact with hot water. So what's the difference between bags and rolls? One, the bags offer the option of zipper and heat sealing. Bags are conveniently pre-cut for quick and easy use, so that they can be pulled out of the box one at a time, for use when needed. Freezing 2 lbs of topside cubes? Roll off just enough of the reel. Freezing a whole salmon? Roll off even more, much more in fact, to accommodate the longer item. Rolls tend to work out cheaper, too, mainly because wastage is minimized. They are a great option, too if space in your kitchen cabinet is at a premium as they will sit neatly in the tightest of spots. Remember though that all these bags and rolls are designed to be used with a FoodSaver vacuum sealing system and you can check out those with legions of fans here. And if, say, fishing is your favorite hobby, they also allow you to vacuum seal the fish as you catch it. That way, you're able to lock in the natural juices, freshness and flavor. Pint bags & rolls (which work out even cheaper than bags). These are the best size for freezing or refrigerating leftovers. They are also the handiest for freezing a handful or 2 of precious blueberries to enjoy during the winter months. Quart bags & rolls. FoodSaver makes these bags as either heat sealed or zipper type. These are great for freezing meal size portions for a couple. Or freezing portioned out venison or rabbit meat, if hunting is your favorite pastime. Gallon bags & rolls. In the bag type, you can get the heat sealed type or the zipper type. These are ideal for freezing large items. The 8 inch x 20 feet rolls are great for sealing and freezing small items, such as half an onion! The 11 inch x 16 feet rolls are ideal for freezing medium sized items. If you want to save even more, get this 3-pack. It’s a steal. The 15 inch x 20 feet rolls are excellent for storing extra large items such as bone-in rib-eye steaks or 8 lb fully smoked Boston butts without having to cut them up, which is obviously tedious. These are also excellent for packaging and preserving game in a portable freezer while out on the hunting trail. Note though that because they are quite thick, the 15" rolls can only be used with the FoodSaver GameSaver Titanium vacuum sealing unit. So please don't buy these bags if don't own or plan to own this vacuum sealer. May be, it’s a good idea to have both. 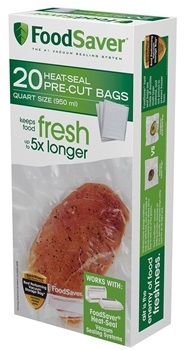 2 - 1 quart Freeze 'N Steam microwave cooking bags. Expandable bags. Each of these sports a pleat so it's purposely designed for those notoriously bulky items. These bags enable you to freeze items that would never fit in an ordinary bag—such as a whole, 15 lb turkey! Freeze 'N Steam bags. These FoodSaver freezer bags will do double duty—in the freezer and in the microwave. So you don’t have to transfer food items for thawing and then have to wash up later. Heavy duty bags. With twice the puncture resistance and nearly one-third stronger than the standard FoodSaver bags, these are ideal for freezing food with prickly ends such as shells and exposed bones. Liquid Block bags. These are great for freezing liquids such as soup or broth or even juicy raw foods such as marinated meats. Portion pouches. These are purposely designed to store single portions so that the entire bag is put to use, and that half of it isn’t wasted. Zipper freezer bags. These clear bags sport a strong reinforced double zipper for an air tight seal and a write on label. They are available in quart and gallon sizes and as a quart-gallon combo.